Although the number of hungry people in the world has fallen below 1 billion thanks to renewed economic growth, it remains 'unacceptably' high, two United Nations agencies stressed recently. With just five years to the 2015 deadline for achieving the MDGs the country as a whole will not be on track for a majority of the targets related to poverty, hunger, health, gender equality and environmental sustainability unless concerted national efforts are made by government and all sections of civil-society working in tandem. This year's hunger figure marked a nearly10 per cent decline from the 2009 level, with the reduction concentrated in Asia, where 80 million fewer people are estimated to be going hungry this year. In sub-Saharan Africa, the drop was much lower at 12 million, with one out of every three people in the region still undernourished. Two thirds of the world's hungry live in just seven countries. Click NEXT to read on . . . 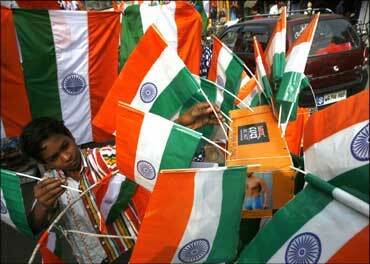 Image: A boy selling Indian flags before Independence Day. The UN study found that two thirds of the world's hungry live in just seven countries: Bangladesh, China, the Democratic Republic of the Congo (DRC), Ethiopia, India, Indonesia and Pakistan. India has been successful in getting children into primary school, in providing access to water and in conserving environmental resources. It is possible that poverty will be halved by 2015 but by no means certain. Major states in India's heartland like Bihar, Chhattisgarh, Jharkhand, Madhya Pradesh, Maharashtra, Orissa, Uttar Pradesh and Uttaranchal, also the most populous states, are unlikely to achieve this target if it remains business as usual. The proportion of poor in these states is currently at 64 per cent of the country's poor and this is likely to increase to 71 per cent by 2015. 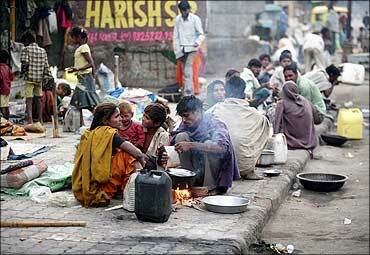 The number of poor in 2015 is likely to be 279 million at all-India level. 46% of Indian children are undernourished. Click NEXT . . . 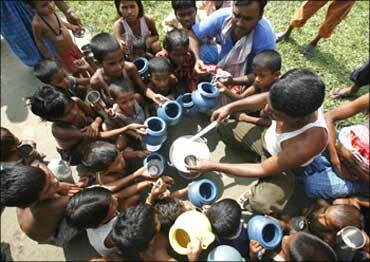 Image: Students have a free meal distributed by a government-run school in Nalchar village, near Agartala. On hunger there are disappointing failures. 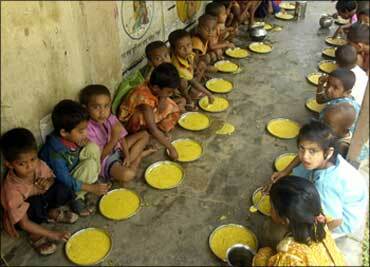 India accounts for 50 per cent of the world's hungry. 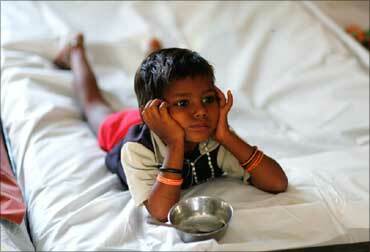 Over 46 per cent of Indian children are undernourished. Health too is a major challenge -- the very survival of India's women and children is threatened. In 2006, on average 254 women died giving birth to a child for every 100,000 live births down from 327 in 1990. The states of Assam, Bihar, Chhattisgarh, Jharkhand, Madhya Pradesh, Orissa, Rajasthan, Uttar Pradesh and Uttaranchal had the highest numbers ranging from 480 to 312. Kerala at 95, Tamil Nadu at 111 and West Bengal at 141 have the best figures. 74 children died before they reached the age of five. Click NEXT . . . Image: Flood-affected children crowd around a relief worker distributing free milk at a flood relief camp in Purniya in Bihar. Over 1.5 million children continue to die every year before their first birthday. Across India 74 children died before they reached the age of five for every 1,000 live births in 2005-06 as compared to 125 in 1990. At this rate India is likely to miss the target of reducing these figures to 42 for 1,000 live births by 2015. On this indicator, Assam, Bihar, Madhya Pradesh, Orissa, Rajasthan and Uttar Pradesh are the laggards while Goa, Haryana, Jammu & Kashmir, Kerala, Sikkim and Tamil Nadu are on the fast track and likely to be early achievers. The UN Food and Agriculture Organization (FAO) announced in a new report that 925 million people will suffer chronic hunger, down nearly 100 million from 1.02 billion in 2009. "With a child dying every six seconds because of undernourishment-related problems, hunger remains the world's largest tragedy and scandal," said FAO Director-General Jacques Diouf. World may not be able to achieve the first MDG goal. Click NEXT . . . 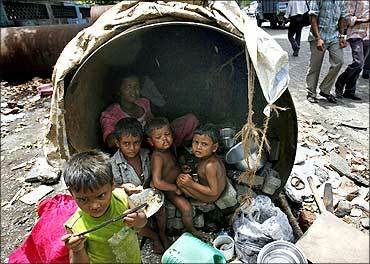 Image: Children eat in their make-shift home in an unused waterpipe in Mumbai. The new statistics, which have been released ahead of the Millennium Development Goals Summit next week in New York, indicate that world may not be able to achieve its first goal of reducing by half the number of people whose income is less than a $1 a day between 1990 and 2015. "The achievement of the international hunger reduction target is at serious risk," said Diouf, noting that the current hunger levels "makes it extremely difficult to achieve not only the first Millennium Development Goal (MDG) but also the rest of the MDGs." The eight MDGs include eradication of extreme poverty and hunger, achieving universal primary, promoting gender equality, reducing child mortality, improving maternal health, combat HIV/AIDS, malaria and other diseases and ensuring environmental sustainability. Recent increases in food prices is very bad news. Click NEXT . . . Image: Homeless people prepare their food on roadside in Ahmedabad. He warned that the continued high level of global hunger hampers the achievement of the Millennium Development Goals (MDGs), the eight globally-agreed anti-poverty targets with a 2015 deadline. Additionally, recent increases in food prices, if they persist, could further impede efforts to curb the number of hungry people in the world. "Vigorous and urgent action by nations and the world has been effective in helping to halt galloping hunger numbers," said Josette Sheeran, UN World Food Programme (WFP) executive director. "But this is no time to relax," she emphasised. "We must keep hunger on the run to ensure stability and to protect lives and dignity." Next week, world leaders will gather at UN Headquarters in New York to assess progress made in achieving the MDGs. Goal 1 is to halve the world's hungry. Click NEXT . . . Image: A malnourished child waits for food at the Nutritional Rehabilitation Centre in Sheopur district in Madhya Pradesh. Goal 1 is to halve the proportion of the world's hungry from 20 to 10 per cent, and with 5 years left till the 2015 deadline, that proportion still stands at 16 per cent. At the World Food Summit in 1996, the quantitative target of halving the number of hungry people was set for the first time, from 800 million in 1990-92 to some 400 million by 2015. For this target to be met, the number of hungry will have to be cut by 500 million in the next five years. According to FAO, the fact that historically the number of undernourished people continued to increase even in periods of high growth and relatively low prices indicates that hunger is a structural problem. Although essential, economic growth alone, the agency noted, is not sufficient to wipe out hunger in an acceptable time frame. "Success stories do exist in Africa, in Asia and in Latin America," Diouf said, calling for such experiences to be replicated and scaled up. Image: 21-month-old Sushila, who weighs 4.5 kg and suffers from severe malnutrition, sits in her mother's lap. How he built a successful company with Rs 30,000!